The goal of physiotherapy is to help patients maximize their functional level and promote wellness by decreasing pain and improving strength, flexibility and quality of movement. Our comprehensive assessments include a review of your medical history and the history of your injury/impairment. Depending on your injury, our assessments also include a variety of objective tests such as evaluation of joint range of motion, strength, mobility, motor control, posture, gait, balance, dizziness and overall functional mobility. We provide detailed reports to your physician and other health care professionals, if necessary. Based on your initial assessment and diagnosis, we begin treatment with your consent. We may use modalities for acute pain management including acupuncture, ultrasound, and electrotherapeutic modalities. We may also employ some manual therapy (“hands on”) techniques. Most people need an individualized exercise programs focused on stretching, strengthening and improving their overall function. Our physiotherapists specialize in treating individuals after motor vehicle accidents or other traumas, including musculoskeletal, orthopedic, and neurological injuries. We also have considerable expertise in treating vestibular/balance/dizziness issues. 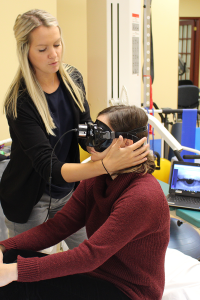 Vestibular rehabilitation involves specific individualized exercises to promote the brain’s compensation for inner ear deficits. In addition we can help with a variety of vestibular problems such as benign paroxysmal positional vertigo (BPPV) where specific manoeuvres are performed to correct the dizziness or vertigo. Dizziness and vertigo can impact all facets of daily living, including activities at home, work and play. Vestibular disorders can be gradual and age-related, related to inner ear infection, or caused by trauma such as motor vehicle accidents, head injuries, falls, contact sports, or secondary to other diseases or trauma. We may use acupuncture as an adjunct treatment to help manage your pain. Acupuncture involves the placement of very fine needles into the skin at very specific locations to activate the release of chemicals and block pain signals. Acupuncture can be used to help reduce pain and inflammation, restore function, reduce stress, promote energy and accelerate tissue healing. Following acute treatment of your injuries, your physiotherapist will develop individualized exercise programs, tailored to your functional losses and recovery goals. Programs are available in our clinic or community based gyms utilizing Physiotherapy Assistants, Personal Trainers or Kinesiologists. Our therapists are aware of the debilitating impact that pain can have on an individual’s recovery. Pain is very complex, and therefore needs to be treated as such. Specialized programs are designed to first help you understand your pain and it’s triggers. We then work towards finding strategies to help you learn to take control your pain in order to minimize its’ effects. Our warm water aquatic therapy program enhances recovery for clients with musculoskeletal, orthopedic and neurological impairments. Specific aquatic exercises tailored to your impairment, ensures enhanced recovery time.